The What: At InfoComm, BenQ unveiled the latest in its line of signage products, the TL240C and TL321C. Designed to bring a new and dynamic approach to digital signage and retail applications, the new models feature 24-inch and 32-inch lightweight display boxes to showcase products alongside relevant audio and video, bringing product promotions to life. The What Else: Featuring an exclusive pixel design, the transparent display strikes the optimal balance between the desired transparency effect and optical performance with a color depth of up to 16.7 million colors per interface. 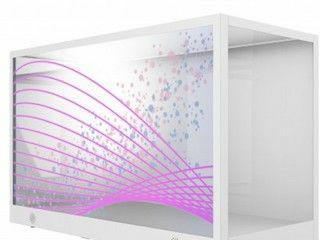 Adding to the ultra vivid effect, the level of transparency can be adjusted according to the lighting source in the environment, style and features of the displayed content to achieve the highest display versatility. The TL Series has an average life span of 30,000 hours, providing several years of nonstop service. With the reliable industrial-class performance and sturdy build, the new TL Series displays are an economic option over many consumer models. Featuring ample multimedia connectivity, the TL240C and TL32IC displays are designed to be easy to set up and convenient to use. They feature HDMI, DVI-D, VGA and USB inputs, supporting today's digital sources as well as traditional analog. Built-in 4W speakers provide clear audio to round out the customer engagement experience. Including landscape and portrait mode display support, the units are easy to customize to fit a variety of applications. The integrated USB display feature allows for cable- and PC-free content setup. Users can load the content onto a USB flash drive and plug it into the USB port. Content appears on the dynamic display in seconds and the most popular media formats are supported, including MP4 and JPEG, for easy content creation and upload.